Home » Posts Tagged "Estée Lauder"
Memories. In 1973, I produced a weekly full page on beauty for The Gazette, the daily newspaper in Montreal. If you know me, you will know they were very visual pages. My Editor knew how important the visual was to me, and used to let me go into the newspaper to check the layout, usually at midnight the night before publication. I am still proud of the articles I did today, and will post some pages later. 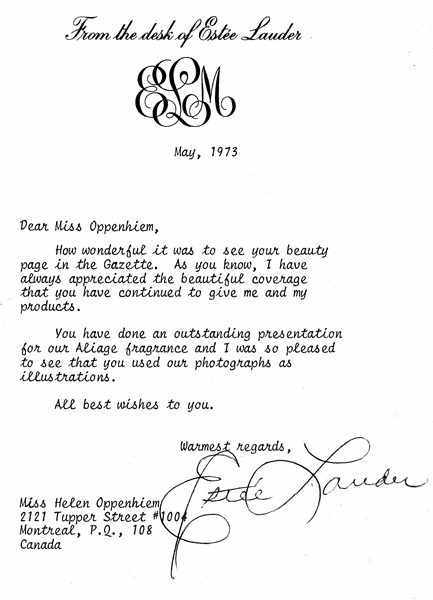 One day, I received this lovely letter from Estée Lauder. Later, I went to New York and interviewed her at her office. The PR set up a tea for me. It was very grand. Even Leonard Lauder came in to say a brief hello. Towards the end of the interview, Estée said she’d like to redo my eyes. Before i could a word, she quickly removed my makeup and made up my eyes! At other times, one of her nineteen PRs, Samantha Drake, took my husband and I to the theatre to see “A Little Night Music” and another time, I remember this PR and the head PR, Rebecca McGreevy, taking me lunch at the Plaza Hotel, where I had Soft Shell Crabs for the first time. They must have loved my full pages. But also this illustrates how very clever Estée Lauder was. A freelance beauty editor, in Montreal, for a daily newspaper, and I got the royal treatment.